TOKYO, Jan, 30 2019 - (JCN Newswire) - Fujitsu Limited and Fujitsu Laboratories Ltd. have applied blockchain technology to develop a system for trading related to energy shortages and surpluses among electricity consumers, including factories and retail stores. Demand response (DR) is a scheme in which electric utilities and consumers of electricity cooperate to control the amount of electricity used during periods of expected peak demand. An issue, however, is that the success rate for DR controls can be low, with consumers being unable to meet the amount of power savings requested by electric utilities. Fujitsu has now devised a system in which electricity consumers can efficiently exchange among themselves the electricity surpluses they have produced through their own electricity generation or power savings. The company then applied blockchain, and with the cooperation of ENERES Co., Ltd., the system was used in a simulation using the actual data of electricity consumption. The result was an approximately 40% improvement to the DR success rate. Improvement to the DR control success rate is expected to lead to more consumers participating in DR schemes. Moreover, this will enable the stable supply of electricity and the expansion of renewable energy use, another goal of the DR scheme. Fujitsu Limited and Fujitsu Laboratories will carry out further system verification and strive to build a carbon-free society. Details of the new technology will be showcased at the ENEX 2019 Energy and Environment Exhibition, being held from Wednesday, January 30, to Friday, February 1, at Tokyo Big Sight. Demand response has been in the spotlight as renewable energies and other initiatives are being put in place to develop a carbon-free society. DR, in which electric utilities and electricity consumers cooperate to control the amount of electricity use, aims to reduce electricity consumption, particularly at peak times when shortages of electricity supply are expected, by paying compensation to electricity consumers who contributed to power savings. In practice, DR is arranged so that an aggregator, who receives the request for power savings from the electric utility and controls the amount of each consumer's power savings, acts as the middleman, and assigns amount of the consumer's power savings. When the amount of power savings requested is achieved, the aggregator receives remuneration from the electric utility. The aggregator also distributes the remuneration to contributing consumers based on the amount of the power savings they achieved. However, consumers are sometimes unable to meet request from the aggregator, due to shortages in the electricity produced when they operate their own generator or due to sudden spikes in their energy consumption, so there are cases of consumers being unable to receive compensation. In order to realize a carbon-free society, it is important to increase the success rate of DR, which indicates the ratio of consumers who are compensated for achieving their power savings targets. It is also essential to secure an investment effect when consumers have joined the DR scheme and to increase the number of participants. At present, the aggregator interacts with individual consumers on a one-to-one basis to allot power savings amounts and to confirm whether the request can be acceptable for the consumer. For electricity consumers to achieve their power savings targets with a high probability, it can be expected that an exchange that allows a consumer who is short of meeting its targets to quickly exchange a portion of another consumer's power savings amount would be effective. This approach, however, has yet to be applied to DR.
Fujitsu Laboratories has applied blockchain technologies it has developed to create a system of exchange in which electricity consumers who have contracted with an aggregator can exchange amounts of power saving among consumers. With DR, it is sometimes necessary to quickly respond to the aggregator about whether power savings can be achieved. 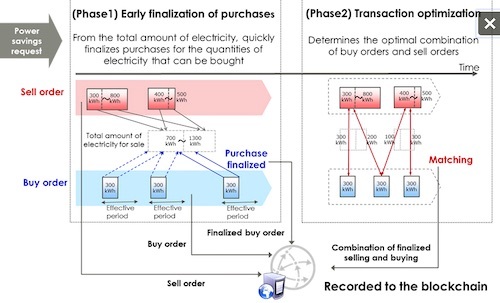 As depicted in figure 2, Fujitsu Laboratories has developed a technology that first calculates the total amount of electricity that can be offered from the sell orders registered on the exchange system, and determines which buy orders can be settled quickly, in turn, for the quantities that can be purchased. As a result, the technology makes it possible to quickly reply about whether power savings targets can be met. The company also developed a technology that optimizes pairing exchange orders, so that, after the response, required sell orders are distributed to the completed buy orders without waste. This two phased electricity exchange technology (patent pending) is built on blockchain, which guarantees the transparency of recorded exchange transaction results. This enables the accurate distribution of remuneration based on the transaction results of finalized selling and buying-the amount of power savings. With this exchange system, even when the requested amount of power savings is difficult to achieved, a consumer can quickly purchase the surplus electricity of another consumer to supplement its own power savings goals, leading to more reliable achievement of the targets. With the cooperation of ENERES, Fujitsu conducted simulations of the new system in the two terms of 2018, summer and winter. Using the actual logs of energy consumption of 20 consumer sites, the companies observed the situation in which electricity consumers could exchange electricity among themselves. As a result, the company confirmed a maximum improvement to the DR success rate of about 40%, compared to conventional methods. By supporting the advancement and popularization of DR with this system, Fujitsu will contribute to the creation of carbon-free society. Fujitsu is a member of the RE100, which aims to have companies use 100% renewable energy for the electricity they consume, and is putting measures in place to build a carbon-free society. As part of these efforts, the company is carrying out verification of this system in a real-world environment, with the goal of commercialization from fiscal 2019. Founded in 1968 as a wholly owned subsidiary of Fujitsu Limited, Fujitsu Laboratories Ltd. is one of the premier research centers in the world. With a global network of laboratories in Japan, China, the United States and Europe, the organization conducts a wide range of basic and applied research in the areas of Next-generation Services, Computer Servers, Networks, Electronic Devices and Advanced Materials. Please see: http://www.fujitsu.com/jp/group/labs/en/.